Using the remote expert capabilities of the Toshiba dynaEdge™ AR Smart Glasses, a technician can connect with an expert for step-by-step directions, access maintenance manuals, as well as record and capture the repair for audit purposes. The dynaEdge™ AR Smart Glasses present a clear path to reducing and improving repair times and lower overall operating costs for the organization. 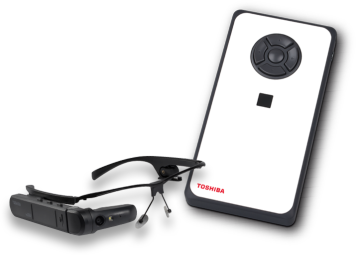 The Toshiba dynaEdge™ AR Smart Glasses deliver a pioneering solution to improve efficiency by giving users the ability to receive step-by-step instructions and access reference materials including videos via the Head Mounted Display (HMD) while keeping their hands free for work. 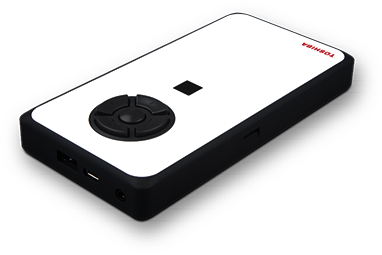 The device also features a high-resolution camera for barcode scanning and streaming video to create the essential quality-assurance tool. The dynaEdge™ AR Smart Glasses keep product flowing and accounted for. Equipped with the industrial-grade smart glasses and HMD barcode scanning capabilities, workers can have order information sent wirelessly to the HMD and work untethered in a warehouse for pick and pack services as well as inventory management. 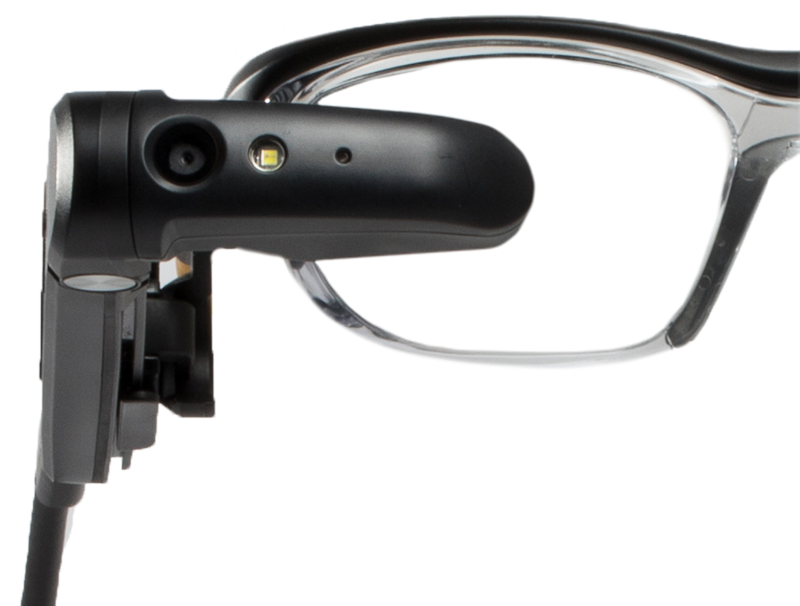 As a wearable solution with the ability to record and capture video as well as display service manuals, the dynaEdge™ AR Smart Glasses are the ideal solution to transfer knowledge within the organization. The ability to watch videos via the Head Mounted Display (HMD) saves time and improves overall task efficiency. 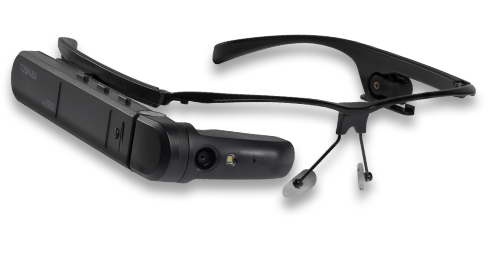 The dynaEdge™ AR Smart Glasses are a wearable, hands-free Assisted Reality solution designed to help large enterprises improve efficiency, quality and operating flexibility. Backed by decades of mobile computing design expertise, the dynaEdge™ AR 100 Smart Glasses provide enterprises a complete solution, incorporating both hardware and software in one turnkey package. To enhance the overall functionality of the dynaEdge™ AR Smart Glasses, Toshiba offers a variety of mounting options to create a solution that can truly operate in any work environment. Options such as Lens-less Frame, Safety Frame, Safety Helmet Mounts and Headband deliver the flexibility and comfort demanded by organizations deploying wearable solutions. As the perfect complement to the dynaEdge™ AR Smart Glasses, Toshiba Vision DE Suite™ 2.0 is the software engine designed to realize the essential functionality of Toshiba’s innovative AR solution. For fast and easy navigation, device functions are grouped into three color-coded menu categories: Communications, File Viewer and Tools. From these three menus users can take photos, record and stream live video, save and retrieve documents, access diagrams and receive text messages. This easy-to-use approach to navigating a robust solution elevates productivity and improves efficiency. In addition to a full suite of on-device services, the software offers IT manager and organizations with advanced synchronization and centralized device management capabilities. Today’s industial enterprises operate in highly competittive, complex, heavily regulated and global environments. Using Atheer’s Augmented interactive Reality Technologies (AIR™), these organizations are reenvisioning the way they work and finding new ways to improve the productivity, accuracy, quality and safety of their desk-less professionals. Easy to deploy and even easier to use, Atheer AIR™ Enterprise has made Augmented Reality real and ready. Need to Contact a Rep or Would Like More Information? Built upon Windows® operating system gives businesses an easy-to-deploy industry standardized tool to do more and stay secure in any work environment. Powered by Intel® processors to deliver the performance for maximum productivity, enhanced security and remote manageability required by IT.